The vagus nerve, historically cited as the pneumogastric nerve, is the tenth cranial nerve or CN X, and interfaces with parasympathetic control of the heart and digestive tract. The sternocleidomastoid muscle has been removed to expose the external and internal carotid artery. The omohyoid defines the inferior border of the carotid triangle. After the carotid bifurcation, the internal carotid artery travels without branches to the skull base, where is enters the carotid canal of the petrous temporal bone. 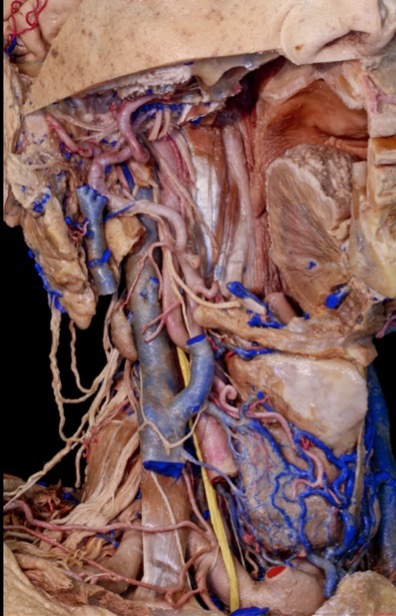 The internal carotid nerve is associated with several cranial nerves: the glossopharyngeal and hypoglossal nerves cross the artery while the vagus nerve continues to follow it. A branch of the glossopharyngeal nerve supplies the carotid sinus. The vagus nerves are paired, however are normally referred to in the singular. Brain tumors, traumatic head injury, and other intracranial processes including infections, can cause increased intracranial pressure and lead to overstimulation of the vagus nerve. As a result, increased secretion of gastric acid may occur which leads to gastro-duodenal ulcer formation known as Cushing's ulcer. A review of original records of Dr. Harvey Cushing's patients suffering from gastro-duodenal ulcers was performed followed by a discussion of the available literature. We also reviewed the clinical records of the patients never reported by Cushing to gain his perspective in describing this phenomenon. Dr. Cushing was intrigued to investigate gastro-duodenal ulcers as he lost patients to acute gastrointestinal perforations following successful brain tumor operations. It is indeed ironic that Harvey Cushing developed a gastro-duodenal ulcer in his later years with failing health. Harvey Cushing's pioneering work depicted in his Yale registry serves as a milestone for continuing research that can further discern this pathway 1). The 10th cranial nerve (CN X) is at risk during surgery in the lower cerebellopontine angle (CPA). To evaluate endotracheal surface electrodes for assessment of CN X motor function during CPA surgery. Twenty patients were enrolled. Electrophysiological recordings were analyzed and retrospectively correlated with clinical, imaging, and intraoperative data. Recordings from endotracheal surface electrodes were reliable and eligible for analyses in 17 patients; in 3 patients, no surface electrode compound motor action potentials (CMAPs) could be obtained. Those patients with sufficient recordings underwent surgery in the CPA for tumors in 14 patients and for nontumor pathologies in 3 patients. In 12 patients, bipolar stimulation of motor rootlets in the CPA resulted in simultaneous CMAPs recorded from both surface electrodes and needle electrodes placed in the soft palate. Coactivation was particularly seen in patients with an intricate relationship between lower cranial nerves and tumor formations (n = 9/10). Amplitudes and latencies of vocal cord CMAPs showed high interindividual but low intraindividual variability. Parameters were not well correlated with the type of surgery (tumor vs nontumor surgery) and lower CN anatomy (displaced vs undisplaced). In 2 patients, vocal cord CMAPs were lost during tumor surgery, which was associated with postoperative dysphagia and hoarseness in 1 patient. Endotracheal surface electrodes allow identification of vocal cord motor rootlets in the CPA. Worsening of CMAP parameters might indicate functional impairment. These aspects support the use of endotracheal surface electrodes in selected patients in whom the vagus nerve might be at risk during CPA surgery 2). Kemp WJ, Bashir A, Dababneh H, Cohen-Gadol AA. Cushing's ulcer: Further reflections. Asian J Neurosurg. 2015 Apr-Jun;10(2):87-94. doi: 10.4103/1793-5482.154976. PubMed PMID: 25972936; PubMed Central PMCID: PMC4421974. Romagna A, Rachinger W, Schwartz C, Mehrkens JH, Betz C, Briegel J, Schnell O, Tonn JC, Schichor C, Thon N. Endotracheal Tube Electrodes to Assess Vocal Cord Motor Function During Surgery in the Cerebellopontine Angle. Neurosurgery. 2015 Sep;77(3):471-8. doi: 10.1227/NEU.0000000000000854. PubMed PMID: 26103443.